Ten years ago, Gigi Lai’s (黎姿) younger brother Stephen Lai (黎嬰) was nearly killed in a car accident that had put him in a coma for three months. The accident rendered Stephen no longer able to live independently, prompting Gigi to take over the helm of his growing skincare clinic. In January of this year, under Gigi’s tenure, the business became a publicly-listed company. Gigi dedicated most of her life to her family. When she was 14 years old, she agreed to enter showbiz in order to help support her struggling family. She sponsored her brother’s medical school career, up until he earned his dermatology license in the early 2000’s. 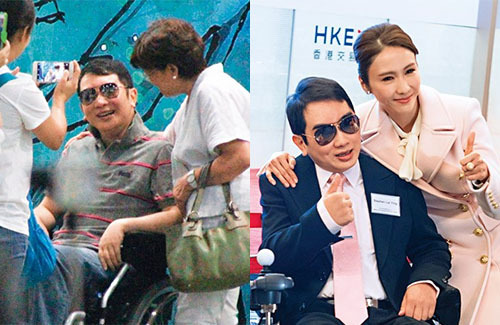 In 2008, a year after Stephen’s accident, Gigi left the acting industry to care for her brother; her last major project at the time was TVB’s The Gem of Life <珠光寶氣>. Gigi took full responsibility of her brother’s hospital bills, and scrounged around the world to find him the best medical specialists. Word has it that Gigi spent at least HK$100,000 a month after her brother’s discharge, including his long stay at a rehabilitation center. When Stephen moved back home with their parents, it was rumored that Gigi added a rehabilitation room for her brother, and hired a private physical therapist. Paparazzi checked in Stephen this month, and the 40-year-old looks almost fully recovered. Though he still has to transport himself in a wheelchair, he is now smiling and talking animatedly with friends and family. Last month, Gigi moved to a HK$44 million luxury apartment in Tregunter Towers, a high-end residential building at The Peak. She purchased an additional thousand sq. ft. property within the building for her parents and Stephen to live in. According to reports, Stephen still has to do about four to five hours of occupational and physical therapy every day. Occupational therapy is a type of therapy that helps patients recover or learn the skills required to function independently in their daily lives, such as learning how to do laundry or brush teeth. Physical therapy helps patients recover lost motor skills, promoting ways to move and reduce pain. Gigi also hired a speech language pathologist to help Stephen regain his speaking ability, along with three nurses to care for him on a daily basis. her brother is lucky to have a good sister but unlucky to have gone to school and practice for only a few years and now can’t even take care of himself. i wonder if he’s still practicing, spent all that time in school would have been a waste if not. @m0m0 Yea, it is very tragic what happened to him. I’m not sure he has the ability to practice medicine. I think he being able to do normal things like brushing his teeth, etc is already a blessing under these circumstances. Gigi sacrificed so much for her family, and continues to do so. I really admire that about her. She is still young, but she’s definitely experienced a lot in life. Gigi is such a good sister and daughter. Really sacrifice a lot for her family. Glad he is getting better! She basically married the dude, who offered to take care of her brother and her family. Yes for $$$$$$$ reasons, and basically sacrificed herself. But it turned out for the best perhaps, in her case. She could have married a fu-er-tai (富二代) from HK or PRC, who might have treated her like dirt, or cheat. Or those who have to creep around their rich relatives, and lead stifling lives, following family rules. Vivian Lai Sui Yan is one prime example. Taiwan’s Hsieh Ling Ling and Peter Lam is another. Her husband seems to treat her like a princess and dotes on her. A lot of these rich families don’t lavish a lot of investment in the direction of the DIL, esp one from showbiz.